Dutch still-life painter. Nothing is known of his life, and his work was completely forgotten for more than two centuries after his death. Only a handful of paintings by him survive, but they show him to have been one of the most individual still-life painters of his time. They are the complete opposite of the lavish pieces by such celebrated contemporaries as Jan van Huysum and Rachel Ruysch, for they are small in scale and depict a few humble objects, characteristically placed on a bare ledge. 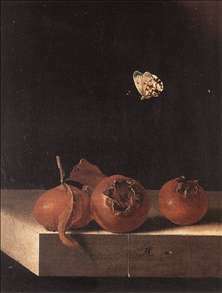 The intensity of his scrutiny is such, however, that they take on something of the mystical quality of the still-lifes of Sanchez Cotn or Zurbarn, and the hovering butterfly that Coorte sometimes incorporates in his work may have allegorical significance. One of his favourite subjects was a bundle of asparagus (examples in the Rijksmuseum, Amsterdam, Fitzwilliam, Cambridge, and the Ashmolean, Oxford). See more details about "Three Medlars with a Butterfly"